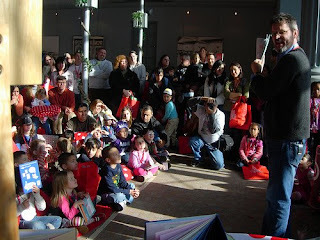 Book-a-Mania is kind of a book store and also a puppet show theater and it was at the library. We got my necklace right when we got in there. The necklace was for my reading passport to get stamps in. My Aunt Amanda was there too. I looked at Corduroy and I showed Aunt Amanda the house. It had Mary Poppins and Jane and Michael and James and the Giant Peach. There was a puppet show. It was a girl puppet and she was so funny. She said this song was before your mother was born and she said she had a dad but she didn't really have a dad. I really liked the princess. She was so hilarious. And she said that she just kissed something. And then I got a Fancy Nancy book for free. I had to go to a table and give them my card with the stamps on it. My favorite activity was a corduroy button that was a necklace and not a real button. I also had a chocolate egg from the bird on your head activity. 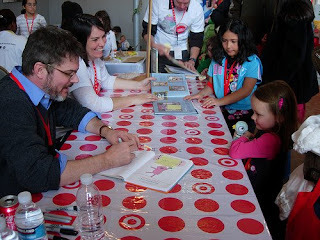 Mo Willems read Knuffle Bunny. He did a good job and he was really nice and he looked different than he seemed in New York. He did a good job reading Are You Ready to Play Outside—better than Mom did. Mom thought that it was not good but then we found out it was. At first I was a little shy but then I wasn't when I was talking to him. I really liked him. He drew Piggie in my book. Kids should go to it—all my friends should go to it and also Jack my neighbor.